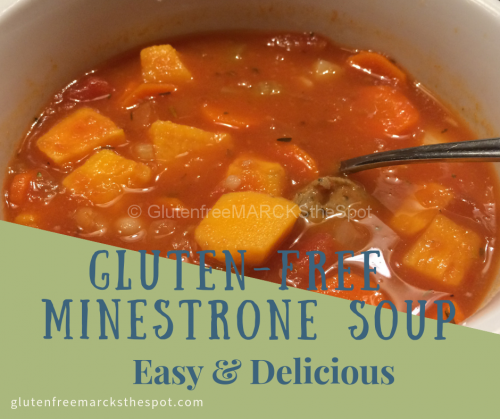 This gluten-free Minestrone soup is an easy dinner to prepare and so delicious! It’s one big serving of health in a bowl. Soup is a great way to boost the health in your meals. It’s a fast way to get lots of veggies and greens, as well as beans, on your plate. They are great for a meal at dinner and make excellent lunches the following day. 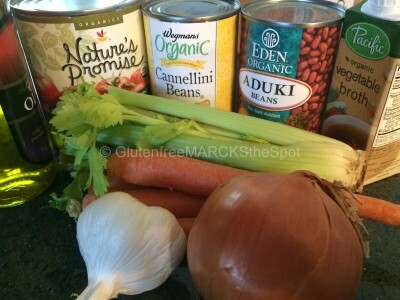 Try this delicious and easy Minestrone Soup for dinner – easy ingredients, easy preparation. This soup can be enjoyed after it’s been simmering for one hour. But, when you have the time, let it simmer for a few hours, all afternoon if possible, and the flavors really come together. Super delicious! Alternately, you may plop all ingredients into your crock pot, letting it cook all day, ready to serve when you arrive home. So easy and delicious it will soon become one of your favorites! This soup has a lot of great, filling veggies full of fabulous health benefits. This is a great soup to get your family to eat more veggies! For the broth, use either veggie or chicken broth, homemade if you have it. If not, Pacific Foods Organic, low sodium broth is a good pick. 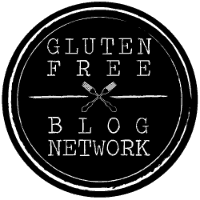 This is gluten-free and fits our allergy lifestyle. If using store bought brands, make sure you watch for high sodium levels and extra additives not needed in the broth. You can also use water in place of the broth and your soup will still be delicious. To use a crock pot: add all ingredients except for sausage, spinach and zucchini in the morning. Sauté the veggies first if you have the time, as this gives more flavor. Chop the sausage and zucchini ahead of time to have ready and keep in the fridge. When you arrive home, add them into the crock pot. Then, wash and pull apart the spinach and add that as well. Cook together another 15-20 minutes and dinner is ready! To serve, place a spoonful of cooked quinoa, brown rice, millet or pasta in the bottom of your bowl. Then spoon the soup on top. Or, simply enjoy the soup as is. You will be amazed on how filling and satisfying a bowl can be! 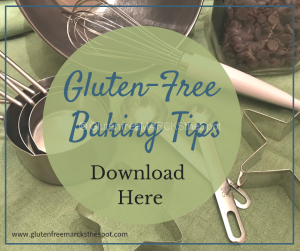 with a delicious zucchini muffin- gluten-free of course! This super easy and delicious gluten-free Minestrone Soup makes a fabulous dinner and is great for left-overs the following day. Great way to get a lot of delicious veggies on your plate! 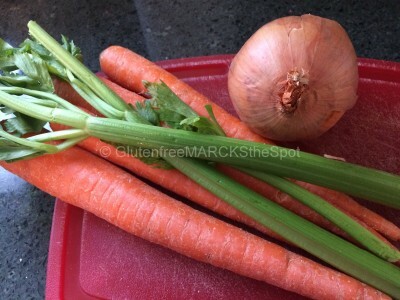 Wash or peel the carrots, celery, onion and potatoes. Drizzle 1-2 T of olive oil into a large soup pot. 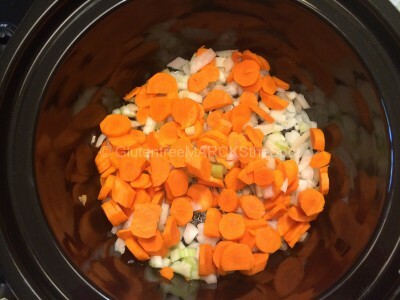 On medium heat, sauté the onions, carrots and celery for about 5 minutes, just to soften them a bit, letting the flavors come together. Add in the broth, either using veggie or chicken broth. You can use homemade if you have it. If not, I tend to use Pacific Foods Organic, low sodium broth. You can also use water in this step. Next add in the crushed and diced tomatoes, along with the water and spices. Bring to a boil. Then turn down to medium–low heat. Add in the potatoes and simmer for one hour. Cut up the sausage into slices/chunks. Wash and pull apart the spinach leaves. If adding in the zucchini, chop into bite sized pieces. Place the sausage and beans into the pot about 30 minutes before serving. Add the spinach and zucchini about 10 minutes before serving. To serve, place a spoonful of cooked quinoa, brown rice, millet or pasta in the bottom of your bowl. Then, spoon the soup on top. Or, simply serve alone with a side green salad or a delicious veggie muffin- gluten-free of course! **If using your crock pot, add all ingredients except for sausage, spinach and zucchini in the morning. Chop the sausage and zucchini ahead of time and have ready in the fridge. When you arrive home, add them into the crock pot. Next, wash and pull apart the spinach and add that to the pot. Let cook another 20 minutes and dinner is ready to serve! 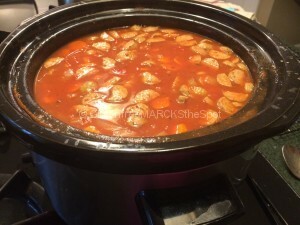 **This can also be prepared in a crock pot: Add all ingredients into the crock pot except for pre-cooked sausage, spinach and zucchini, in the morning. Chop the sausage and zucchini ahead of time and keep in the fridge. Turn the crock pot on all day, when you arrive home, add them into the crock pot. Next, wash and pull apart the spinach and add that to the pot. Let cook another 20 minutes and dinner is ready to serve! 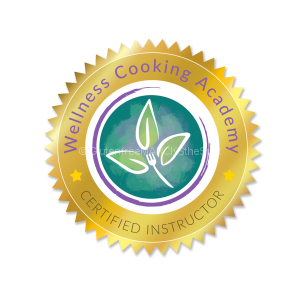 Don’t want to miss any new recipes posted? Sign up to receive my weekly updates – emailed right to your inbox every Tuesday! 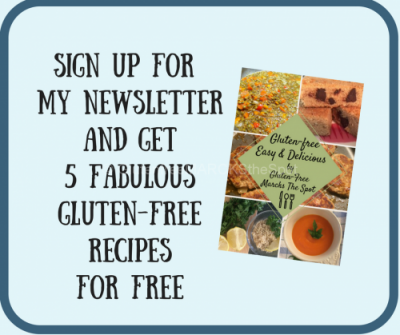 Sign up today and receive 5 Easy and Delicious Recipes for FREE! 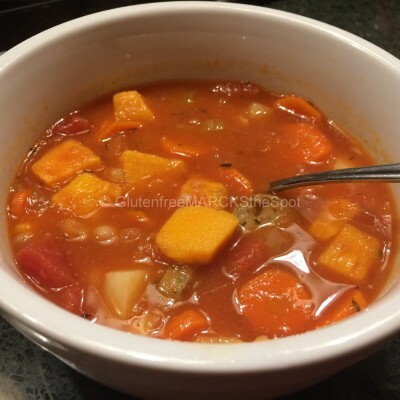 This entry was posted in Gluten Free Living, Recipes and tagged easyglutenfreedinner, glutenfree minestrone soup. Bookmark the permalink. Thanks! It's a super easy recipe to have ready as you walk in the door after a long day. Either make it the night before, or have it simmering in your crock pot while you are out for the day. Dinner is done! Glad you enjoyed it!